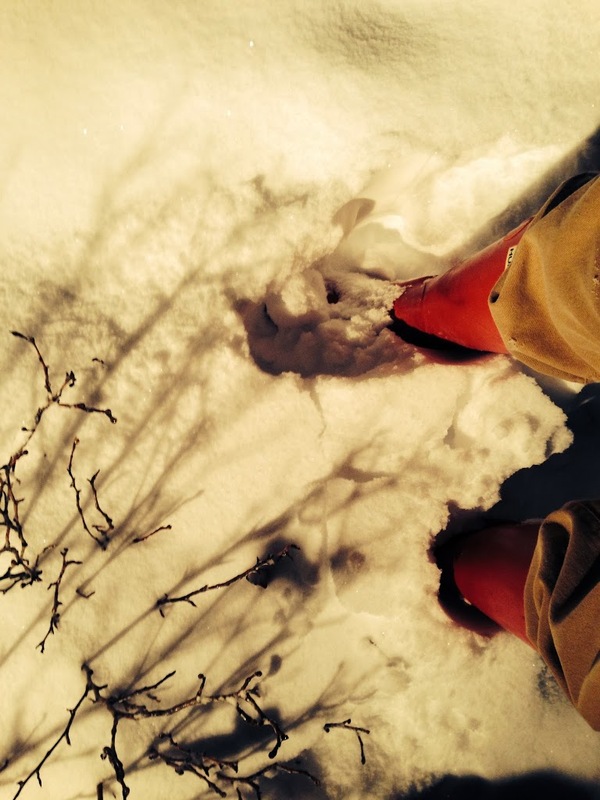 The snow was so deep that I had to put on my rain wellies to keep my socks dry when I went outside to feed the birds Friday evening. Thursday, I had added a big scoop of sunflower seed to the main feeder and jerry-rigged a broken suet feeder so the more adventuresome woodpeckers (we get many down woodpeckers at the feeders) could stop pecking at the treated post and eat suet, instead. I have a third feeder that holds thistle for the smallest birds, clingers, like wrens and finches. But by Friday afternoon, the sunflower seed was nearly gone and the ground-feeders were on the hunt. Juncos are ground-feeders who adore thistle. They stray from the feeders and come hang out on the porch, looking for seed. So, of course I put a little out there for the pleasure of both the birds and our (indoor) cat. The masses of birds (cardinals, juncos, woodpeckers, pigeons, tufted titmice, plus one squirrel) were the first thing I noticed when I looked out of the window at 6:45 a.m. Sure, there was plenty of snow. But substantial snow cover means ground feeders can’t find food easily. I feed birds all year round, though winter and nest-building season in early spring are the busiest times. I used to stress out about feeding too many squirrels. Honestly, we don’t have that many that hang around the feeders. With 12 acres of woods, and plenty of forest around us, we get only the lazy few near the house. What I do mind are the chipmunks and moles who tunnel all around our house and yard (and in my garden! ), drawn by the grubs that feed on whatever the birds leave behind. A few years back we had a professional mole trapper come, but after he charged us $250 for catching 10 or so, he gave up, saying that he could never make them all go away because of the huge population. I deal with them tunnel by tunnel when they show up in the spring. I was glad I’d banked up the feeders Thursday since I didn’t care much for going outside on Friday. My obsessive driveway scraping rather wore me out so that I started dreaming where I was sitting Thursday night around 10:30. At one point Friday afternoon I was trying to remember where I’d seen lines of men in gray overcoats carrying giant, yellow, symbol-covered, triangular traffic signs in their arms as they paraded up and down a city street. Then I remembered that brief dream. I wrote some fiction, finishing up a chapter that will be in a book that will eventually be another BLISS HOUSE novel. (BLISS HOUSE is a fictional, haunted Virginia house built after the Civil War. It is stuffed full of stories, and I’m not sure how many novels it will take to tell them all.) I’ve been struggling all week to get a good solid block of writing time in, and I finally did. In order to do it, I had to turn off my phone for 3 hours. I thought it might kill me, but I did it! And it was definitely worth it. So, the birds are fed and the pages are written. For now. It was a good day. 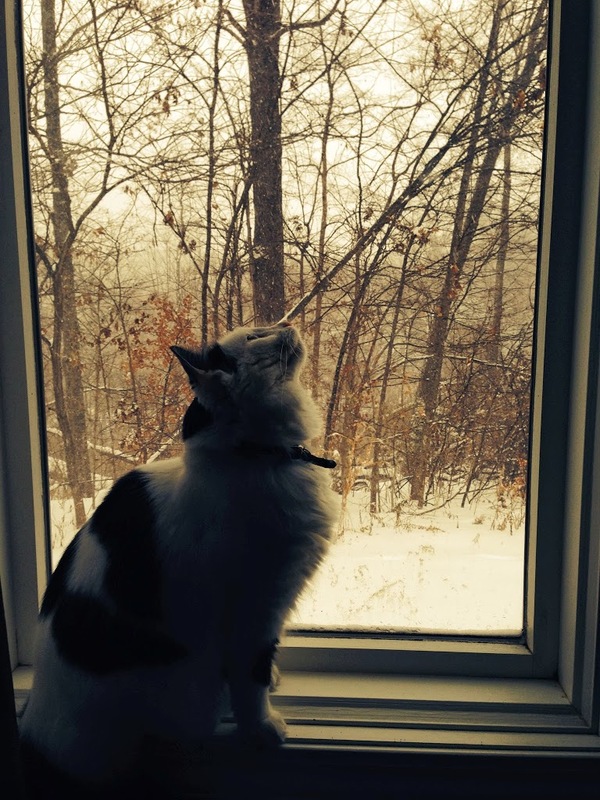 Below is a gratuitous pic of Miss Nina, our cat, as she looks out for birds in the snow. I posted it on Facebook, but I like it so much, I wanted to share it here, too. Plus, it looks like she’s balancing a tree on her nose, which is all kinds of awesome. Nice photo of Miss Nina Garcia. 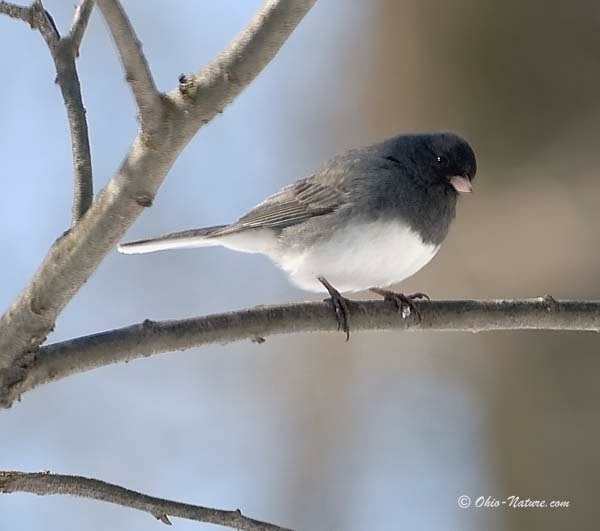 Juncos, huh? I think those are the birds I’ve been watching on my roof. I’ve been having a hard time identifying them as some type of sparrow.